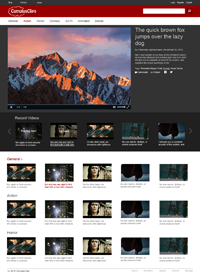 The Newsroom theme turns your CumulusClips site into a minimized video experience focused on continuous video playback. It mimics the video sections of several prominent news websites. Many features from the platform are disabled by the theme to focus on the central video playback. It's a responsive theme that adapts to large & medium desktops, tablets and small devices.